I'm not crafty. I admit that. The fact that I completed this keychain and it's still intact is nothing short of a miracle. Scrapbooking? No way. Uh-uh. Not me. That was for the craftiest of the crafty. But, we live 700 miles away from our family. 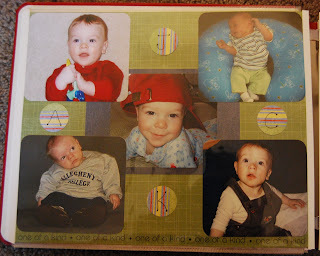 So, as we contemplated what to give Jason's parents for Christmas this past year, I suggested a scrapbook of memories they've shared with us and the boys...starting with Jack entering our lives! It was a tremendous amount of work, and Jason lovingly watched the boys evening after evening as I worked to complete it. It truly was a labor of love (for both of us!). But, I enjoyed every moment I spent working on it. And most importantly, Grandma and Grandpa loved it. Here are a few pages that I really love. *I must thank Mary at Not Before 7 for all of the help she gave me in choosing just the right book size and making sure I had all the right tools and supplies to complete this scrapbook! Trust me, I had nothing and knew nothing! She was incredibly patient. 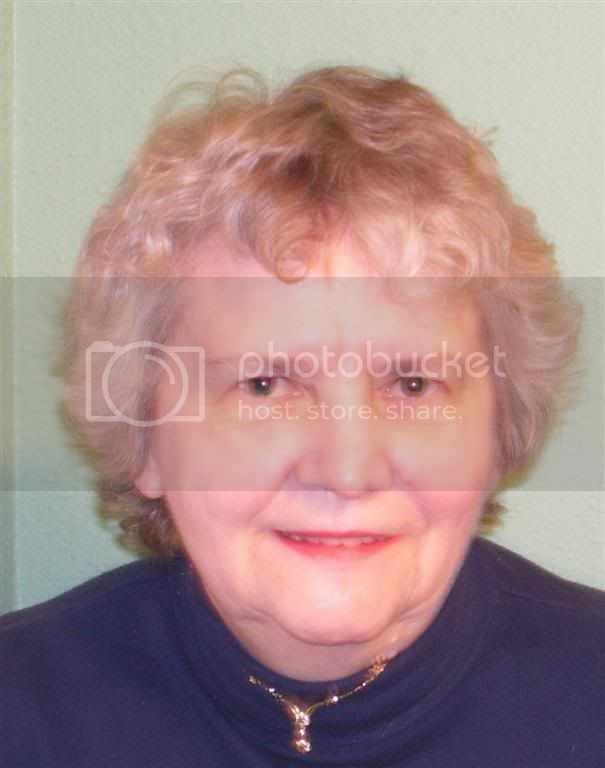 Thanks again, Mary! For more Show and Tell, stop over to Kelli's. Lovely, you did a wonderful job…. I would say that is the best gift ever…love is priceless. 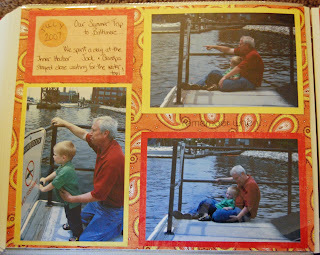 I love scrapbooking- you did a great job. Careful- it is sooooo addicting! fantastic. And yes, you ARE good at it. Don't put yourself down...the work you've done is great. 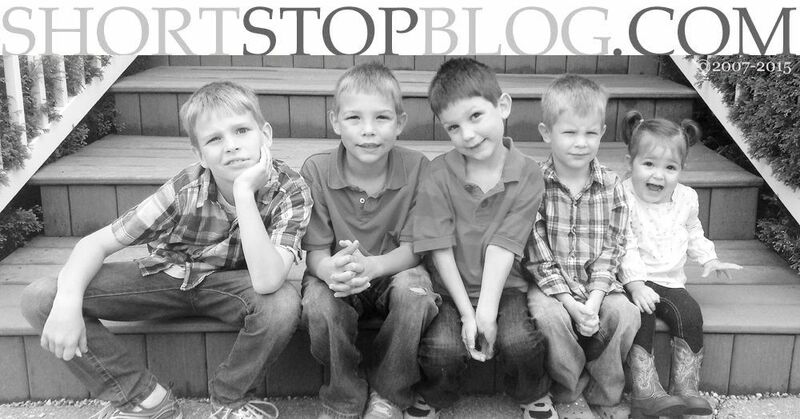 PS ---love the photos of your boys on the sidebar. My Show n Tell is quite eclectic, if you haven't dropped by yet, do so. I hope to have you visit. Sarah those were beautiful! What a precious gift for your parents-in-law. 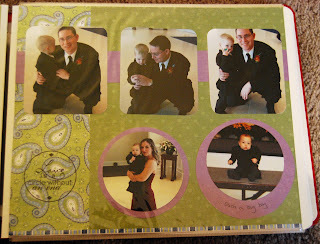 Seeing stuff like that makes me want to do scrapbooking if I had some extra time. It would force me to do something with all those pictures I take! Great S & T!!! I'm so glad you shared the scrapbook with us - you know I've been wanting to see it! Love it - very, very cute!! I'm sure they will treasure that for a very long time!!! I really loved a lot of those paisely patterns - very, very cute! Kinda reminded me of a certain brand of fabric purses! 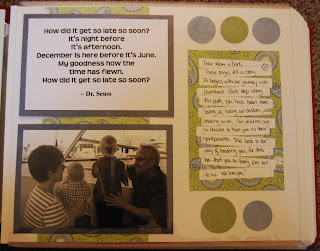 I love scrapbooking and can see you put lots of work into this - it looks great. I know they will treasure it! this is great. a family record to be cherished always! i’m not participating in "S&T" today...had a little mishap this morning...i posted a note about it. have a blessed day! Sarah - that is awesome! I love to scrapbook but just haven't had time in, well forever to do it. You have inspired me to find/make some time to do something I love and preserve those memories. Oh, I am not crafty either, so my pages aren't the most beautiful but it is fun! What a great job you did on the scrapbook and what wonderful pictures. Thank you for the nice comments you made about my DVDs and yes, that is my kitchen in the banner. I hope you will come back to visit. You did a great job! 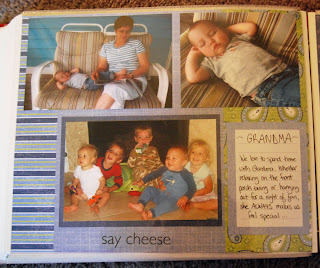 I LOVE to scrapbook and it is very time-consuming (for me). I am a GIGI so I would love to get something like this on my grandkiddos! It looks great - I'll bet they love it!! Hi Sarah! Well, I'd say you are offically crafty now. That is a beautiful scrapbook! What a wonderful gift!! Great job! I was just looking at this the other day at mom and dad's. it really is awesome. I don't know why you say you're not crafty; you're really good. What a great project! You have a knack...keep it up. What a lovely scrapbook. The baby pictures are so precious! You have a lovely creative touch. You are crafty! Those were great pages. I am not a crafty person either, and have done ONE album (my honeymoon). I bought two albums to start my kids pics with, but they sit in the computer room collecting dust. What a wonderful gift. Truly a labor of love. Scrapbooking is my favorite thing to do in my free time (What free time?) I'd love to see what your album would look like if you were "crafty," because it was excellent. ~and that's from someone who's about to begin her 15th album. Did I recognize Creative Memories' supplies? The best ever! 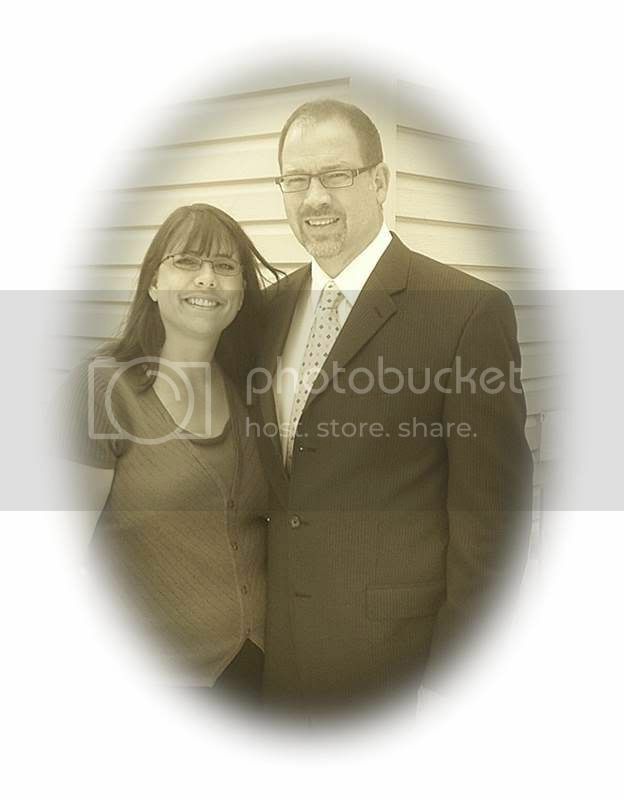 I love Aunt Sharon and Uncle Dave- Very loving and special! what a beautiful book. i'm sure grandma and grandpa absolutely loved it. thanks for sharing it. 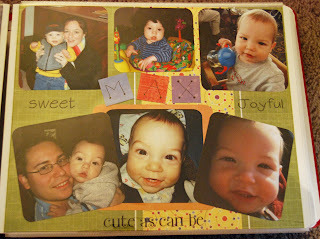 so what do you do with all your photos if you don't put them in scrapbooks? your pictures are too cute to keep in a shoebox. What a wonderful keepsake!! You did a great job! I would not have guessed this was your first. As if I helped you rock out that book at all....that was ALL you girl and it is SO fabulous! I love the simplicity of how you did your book. 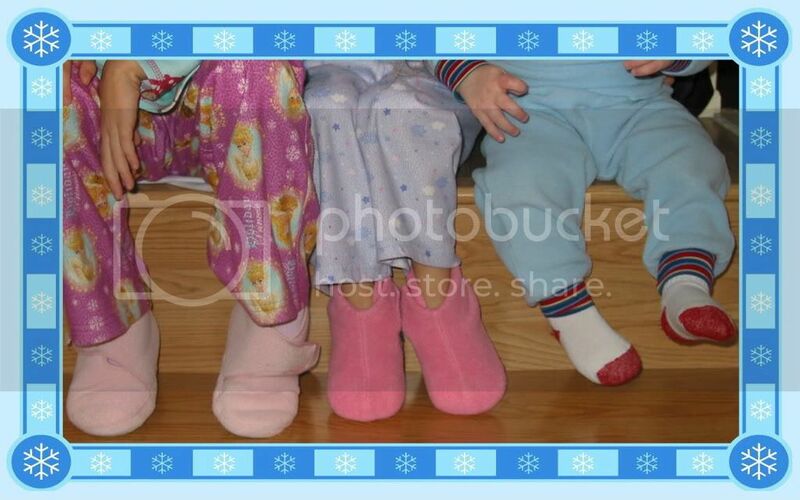 I redid Linds and Alicia's baby photos and never had the ambition to tackle Jen's. After seeing how you made it look so great and yet not too much detail I think I will have to start a new project. Sarah, this post is so wonderful. I didn't get around to everyone this week, only about a third of folks. I will do better next week! Glad you came to see me so I could swing back over here to see your scrapbook! Have a lovely evening. Oh, you did such a wonderful job on this album! You are a great scrapbooker! It will definitely be a treasure forever. YOur scrap book is great! I am so impressed, my photos are either in boxes or on my harddrive, and my 'baby' is 12. thanks for your visit to my blog! Tell me you didn't do this in the past 6 weeks. You're amazing. OH MY GOODNESS, SARAH!!!! I don't know how I missed this!!! You did SUCH a great job! What a wonderful album! I just looked at every page, and it was so nice to see your handwriting again. You are BEAUTIFUL...I love how your hair goes from blonde-ish to brown. Your boys are adorable and certainly blessed to have you for their mother. I can't believe you posted the ENTIRE album!!! That must have taken forever! Thank you so much for sharing it. I LOVED IT!! !